After almost exactly two years, I’m moving out of Berlin, back to Hawaii before my probable return to Japan. When I first got here I didn’t know a single person. I came here expecting to work at my academic affiliation, but perhaps because of the school’s financial problems or the change in management upon my arrival, it was hard to even get a desk at the studio (a commodity I had been taking for granted all along.) I worked at a public computer in the lab until classes started — in the same room — which is about the time when I gave up trying to be regularly present at the studio. As a result I did most of my work independently. Perhaps because of this I met a range of people that extended far outside the academic circle that were doing music or art. I met almost no Germans doing music in this adventure – the vast majority were foreigners like myself who came to Berlin for reasons similar to my own. This combined with my interest in Japan (being Japanese, and not being Japanese,) led me to meet a high ratio of Japanese doing music or art. When I first got here I googled the Japanese in Berlin subject a bit and found Momus’s blog post to be insightful and helpful. 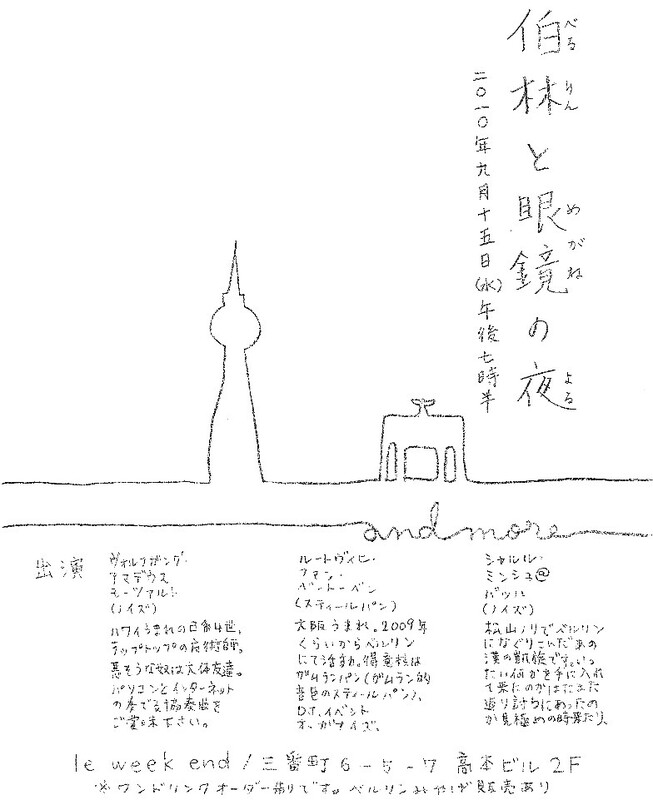 In case my own experiences might help others I would like to go over my impressions and findings with respect to the Japanese communities in Berlin over the past two years. Incidentally, (as opposed to the method of tracking and stalking,) after taking a second look at it, I now realize that I came to know and work with about half the people on that click opera post. This validates Momus’s statement about the size and consciousness of the Japanese community. By consciousness I am referring to the recognition between Japanese artists here. This is in stark contrast to the humorous observation I have heard several Japanese people report on how Japanese try as hard as they can to ignore other Japanese when overseas. One thing struck me immediately upon arrival was the educational bias towards the arts. The Japanese I befriended (many who were at a university for arts) cannot be used as a sample, so take this next example as more objective evidence. I I went to Berlin’s TU (Technical University) orientation, where they had a graph of new students by nationality. There were many Europeans (over a thousand), Chinese (hundreds), and Koreans (tens), but only 1 Japanese was listed. This is in stark contrast to my studies at UW and Dartmouth, where there were more Japanese in Business or Engineering than in Music/Art departments. Essentially, in my makeshift psuedo-statistical analysis, the Japanese were more biased towards the geographical specialty than other nationalities. Germany is a country who’s engineering programs are probably quite good, but not the best, so those seeking a phd in engineering would rather apply to MIT or Stanford. I don’t know enough to say anything about German art programs, but regardless, if the previous claim is true, then you can understand why such a mentality would bring more Japanese doing arts to Berlin. A Japanese guy recently told me (somewhat jokingly) that there are so many Japanese guys doing music that if you see one, you can assume he’s doing music until told otherwise. (Also if it’s a girl she’s probably doing art). Of course this is an over generalization. There are many Japanese who just come here on a working holiday visa to experience life in a foreign country without any particular modus operandi. The range of music in Berlin is wide yet bound. I really have no way of determining if this is just a result of my subjective experience, but I can say that I expect certain types of music in certain areas. For example, I have been to probably around 70 shows in Kreuzberg/Neukoelln, and the number of bands with guitar and drums that I have seen can be counted on one hand. Computer Music, Noise, Electronics, Minimal Techno. These come to the top of my head first. In December 2009 I went to a concert that Daisuke Ishida organized. I went because the lovely folks at NK said it would be worth my time, and indeed, it was a well done concert. There Steim’s DJ Sniff (takuro mizuta lippit) and EVOL performed, along with Alberto DeCampo, who is a very nice guy as well as a professor at the UdK and develops tools that big noise names like (Florian) Hecker and Karkowski use. What I know of Daisuke’s own music suits my tastes quite well. On one piece I heard the technical synthesis layer focuses on timbre at the signal level (with probably custom oscillators,) and refreshingly crisp control over the movement and development of the piece. Daisuke also does installations including one with digital/media artist Akitoshi Honda, whom I’ve worked on several projects with. Later I began to work more with Shintaro Miyazaki, who focuses on media theory and also does performances using sonification. Most of these projects are already discussed in other pages, so I won’t go into them here. But it is worth mentioning that Shintaro also put together the organization ‘la condition japonaise’, which has put on a lot of events from music to dance to art exhibitions that involve members of the Japanese community. Seeing an organization that is tied to a culture or nationality is nothing new, but usually the focus in such a case is on ‘ethnic’ or ‘cultural’ events, whereas ‘la condition japonaise’ put on events that were essentially exhibiting the artists for what they were, providing a support base for the community. It was through events like these that I met many non-musician Japanese artists and dancers. I’ve written about Tatsumi Ryusui quite a bit on some of our collaborations. I met Tatsumi at a concert at staalplaat where a french noise musician (can’t remember his name) destroyed a turntable, and computer musician Tetsuya Hori performed just after my arriving in Berlin. Tatsumi looked like a guy that I should talk to, so I did it, and now I’m his flatmate. I think it is generally true that when you are new to a city you are more willing to talk to people that you don’t know. I’ve moved cities about 6 times now so I understand this feeling. But at Berlin concerts there is something in the atmosphere that makes it even easier to do then it was for me in Japan or the US. I’m not exactly sure what to call it, but I still feel that is easier in general to communicate between groups. That’s not to say the politics and competition in the arts don’t exist – on the contrary, there have also been awkward moments. But I’m an awkward and shy guy to begin with, so maybe this qualifies me just a bit more to be a metric of the ‘openness’ of a city. Anyway, explaining Tatsumi is a very complicated. He is a professional Itallian chef and has a natural knack for understanding certain things that are difficult to explain. Food is one of them. (I still don’t really understand how food works, but Tatsumi has taught me how to make pizza with out explaining it to me). His view on music is also quite mysterious. I could never ask him what it is, and if I did, I don’t expect I would get the answer. But by observing him over two years I can feel that he has the ability to strongly believe in a musical idea without the necessity to explain it. This is in contrast to the academic viewpoint, where analysis and explanation comes before belief, or at least should follow it. But at the same time it is not at all containing the type of anti-academic sentiment I sometimes see in ‘rebellious’ academic musicians seeking to topple the ivory tower. I’ve mostly seen Tatsumi work with guitar pedals and found objects to achieve a certain target, but lately he has been working on some electronics work via circuit bending of preamps that looks promising and reminded me of some David Tudor neural network type sounds. I’ve also seen a few of Seiji Morimoto‘s concerts at staalplaat. In the shows I’ve seen he uses small and fun gadgets/trinkets, which individually do not create the most interesting music, and manipulates them to cause a dynamic musical texture to emerge, while not being afraid of silence. The visual manipulation of the objects is also very entertaining. In this regard I found some of the elements similar to Kanta Horio’s work. Shingo Inao is a former student of Takayuki Rai, whose music I am fond of. He performs with a very unique interface to his computer music. The instrument is very large, causing the performance to cover a significant amount of space. The performance is very intimate, and I don’t mean this in a sappy way. If you’ve read my other blog posts you know this concept of understanding the interface is one that I am always blabbering about. The intimacy I’m referring to here lies between Shingo and his instrument – he seems to really understand how it works and what needs to happen next. There is experimental electronics/computer music, and there is also the club/DJ scene which does overlap. Iku Sakan is a great example of this, as a DJ who uses brave techniques, while also doing shows that use various instruments including his voice or computer based synthesis/modification to yield emotionally rich performances. I actually met Iku in Japan at a concert we both were doing, arranged by some friends from Berlin. At that concert Iku was playing the steel drum. At first I had a hard time figuring out what was so different about Iku. He’s not an academic, and he’s very humble about himself, referring to himself as a ‘record collector’ and ‘just an appreciator of music’, but at the same time he is willing to undertake the challenge of performing with such a wide range of instruments. Bushisms aside, being able to shoot from the gut is a great ability that sometimes I feel like academia can take out of computer music for certain individuals (me). This just makes it all the more hard to pin Iku down as a certain type of performer or artist. This combined with his fluidity between different mediums is what makes his performances interesting. At first I was planning to talk more in general about the Japanese community, but I feel this post has been come long enough already. For this reason the Japanese visual artists and dancers that make up the community are not described here, but I should say that I find it quite remarkable how interconnected everyone is, between disciplines, with hubs that extend outside of the art venues into Japanese restaurants such as smartdeli. Not speaking very good Japanese, and not growing up in Japan, I feel somewhat like an outsider in this community, but after asking a couple people in the Japanese community about their thoughts on the community and hearing that they felt also like they are outsiders, I now feel like that might just ironically be the way the average ‘community member’ feels within a well-connected community, in the same sense that a fully connected network is an inefficient usage of resources. There are of course many more people I could write about, but I chose to write about the ones I have interacted with or seen most in the light of this feeling, hopefully providing a more or less honest slice of the community space instead of a snapshot, which I should not be trusted to take. So why leaving Berlin ! ?